7/2/14 – Solid big build, Joe Mauer comparison. Big target at first base has a good presence at the position. Soft hands and good footwork and range. Good approach at the plate with a great knowledge of the strike zone. Calm and smooth load and stance, allows the outside pitch travel deep in the zone. Quick hands, able to turn on the inside pitch, keeps his hands inside the ball and hits to all fields. Went 3 for 3 with line drive singles to left, center and right field. 6/30/14 – Long lean body type. 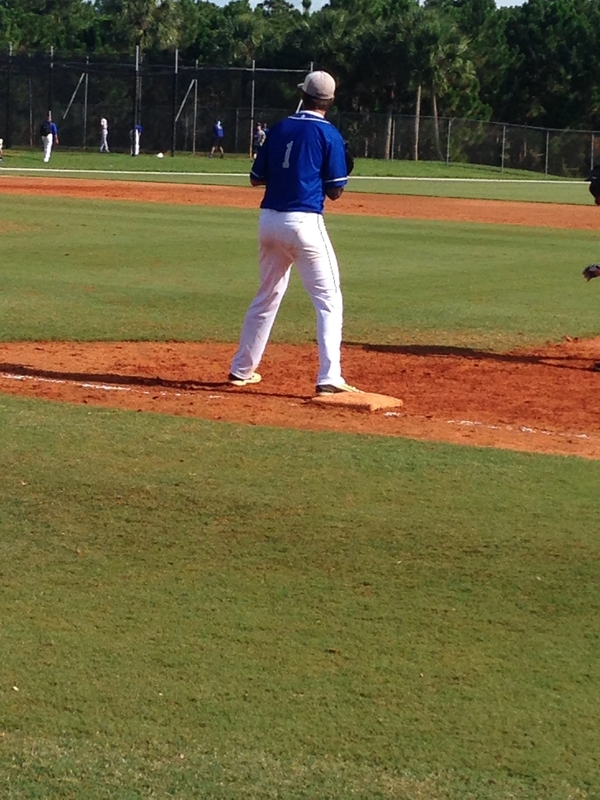 Good footwork in the field and showed good range at shortstop making two good backhand plays in the game. He is quiet in the box with quick hands and a consistent line drive hitter. 7/1/14 – Athletic body able to field well off the mound. Short arm stroke and worked fast. Fastball was 81 to 84 consistently around the plate, curveball was 71 to 72 with an 11/5 break. Has a lot of room for development. 7/2/14 – Big physical athlete. Good actions at third works his glove through the ball with a strong arm across the infield. Powerful connected swing with plus plus power and an aggressive approach at the plate. Major division one and professional prospect. 7/2/14 – Sets a good target for pitchers with good footwork. Receives well and is a great blocker. Strong arm with 1.9 to 2.0 pop times. Good presence at the plate, calm stance and good approach. Line drive stroke with good power to both gaps. Allows the ball to travel deep on the outside pitch and has quick hands keeping his inside the ball on an inside pitch. 7/1/14 – Balanced over the rubber with a high ¾ arm slot and a strike thrower. Fastball was 79 to 85 with arm side run. Curveball was 68 with a 1/7 shape with mid depth. Changeup was 73 with some arm side run. 6/30/14 – Solid approach at the plate. Stays square to the ball with good barrel accuracy. Direct bat path line drive hitter gap-to-gap. Went one for three with a double and two hard contact outs. 6/30/14 – Fastball was 83 to 88 consistently 86 with arm side run and a ¾ arm slot able to command both sides of the plate. Slider was 76 to 70, 10/4 shape worked both sides of the plate and threw it for strikes. Curveball was 67 to 69, 11/5 shape with good depth. Smooth inline delivery with arm side action, repeatable delivery. Had good mound presence and held runners well. 7/1/14 – Long lanky body with plenty of room to fill out. Throws over the top with excellent tilt and downward plane. Fastball was 79 to 80 consistently around the the plate. Curveball was 65 to 70 with 10/4 shape, displayed good control of the pitch. Very projectable player, definite college prospect. 7/2/14 – Large projectable frame body projects at 1B. Good foot work around the bag, moves well for his size. Relaxed athletic stance and generates bat speed. Good gap power with more in the tank. 7/2/14 – Performer. Manager of the game and the pitcher, consistent block ability. Quick release with an above average arm and is an aggressive thrower looking to throw runners out. Quick hands and pull side pop. 7/1/14 – Excellent action and footwork, solid arm, and showed good range. Balanced at the plate, has good plate coverage, knows the strike zone, uses the whole field. Line drive guy. Made all the plays in the field. 7/1/14 – Spark plug. Shows good first step and range. Slap guy uses the whole field. Runs well and is aggressive on the base paths, had two stolen bases in the game. 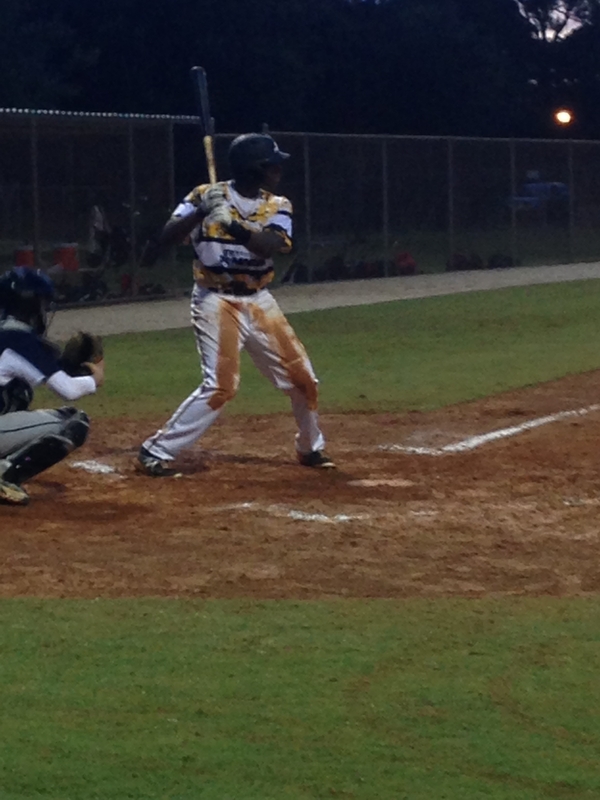 7/1/14 – Big frame showed a nice target behind the plate. 2.1 pop time. Upright stance at the plate with good plate coverage. Used the whole field, gap-to-gap guy. 7/2/14 – Slender athletic build. Smooth fielder with a plus arm. Slightly open stance, uses the whole field who is a plus runner and aggressive on the bases, stole a couple bases and scored two runs. He is a game changer and one to watch. 7/1/14 – Athletic body with good energy. 1.97 pop time strong accurate arm and quick release. Throws from multiple arm angles and looks to back pick runners. Will continue to develop and has solid upside behind the plate. 7/1/14 – Tall slender frame high ¾ arm slot, short arm delivery. Tall and controlled balance point, separates on time, good pitch ability. Fastball was 85 to 82 with arm side run. Curveball was his best pitch 77 to 72 with a sharp 12/6 break, thrown with fastball arm speed. 6/30/14 – Good frame with room to go. Shows good range in the outfield and backs up bases well. Quick hands through the zone, short compact swing. Drives ball well to the gaps. 7/1/14 – Strong stocky build. Receives ball well behind the plate. Balanced and strong stance in the box. Excellent power and good plate coverage, tough out puts the ball in play. Hit a two run home run down the left field line. 6/30/14 – Durable body uses his lower half well and has a nice arm stroke. Fastball was 84 to 85 and his curveball was 73 to 74 with a 10/4 break. Definite college prospect. 7/2/14 – Tall lanky build. Nice loose arm stroke with good downward tilt. Fastball was 80 to 81, Curveball was 66 to 68 with late break. Worked fast consistently around the strike zone. Excellent pitch differential between pitches with nice mound presence. 7/2/14 – Solid athletic build. Good athleticism and instincts behind the plate. Clean exchange, quick and loose arm, and playable and agile footwork. 2.1 pop time. Athletic set up, slightly open strides balanced with good lower half rotation. Good bat speed with strike zone awareness. Line drive hitter with gap-to-gap power. 7/2/14 – Athletic body. Nice actions in the infield, arm has good carry across the field. Nice swing with good hands and ran well. 6/30/14 – Good athletic build with room to grow. Soft hands with good range at shortstop. Good calm load with a short compact swing, stays balanced through the swing. He barrels the ball to all fields with a line drive approach to all fields. Knows the strike zone well. Had a single to left field and a single to right center. 7/1/14 – Big strong body that projects well. Fastball ranged from 78 to 83 with good command of the pitch down in the zone. Mixed pitches well. Competitor on the mound and threw a complete game shutout. 7/2/14 – Athletic build. Patient at the plate with an up the middle approach. Has a short simple stroke and good hands, keeps his hands inside the ball. Good speed and aggressiveness on the bases. 6/30/14 – Repeatable delivery with a high ¾ arm slot with good movement. Fastball was 82 to 84 with slight downhill action and arm side run. Threw a plus changeup with great depth down in the zone that was between 71 and 72. 6/30/14 – Physical, strong, athletic build. Good footwork in the field takes good angles to the ball, athletic fielding position. Quick transfer and quick release has soft sure hands with an accurate throw with carry. Good balance at the plate with quick bat speed through the zone. Gap-to-gap power and able to drive the ball to all fields. Went three for four with two singles and a double and two RBIs. Participating in the 2014 Under Armour All America Game. Committed to Tennessee. 7/2/14 – Good shortstop build. Plus range along with soft hands and a smooth transfer to a good arm throwing it across the diamond. Good approach at the plate, good plate discipline. Able to hit to all fields, smooth load and get his hands through the zone quick. 7/1/14 – Tall athletic frame. Took good routes and had good jumps, quick instincts, in the outfield had sure hands with strong accurate throws. Athletic set up at the plate, smooth load, fluid rythm, strides square with good rotational in his lower half. Moves well for his size running 4.66 home to first. 7/1/14 – Jared Weaver type. Loose repeatable delivery with a tall controlled balance point and a low ¾ arm slot. Good extension on front side stayed inline to target with a square landing. Fastball was 80 to 86, consistently 83 with a down angle, hit outer third for strikes. Slider was 71 to 76 10/5 shape with fastball arm speed, threw it for strikes and was his strike out pitch. Worked fast with a good tempo and pounded the strike zone. 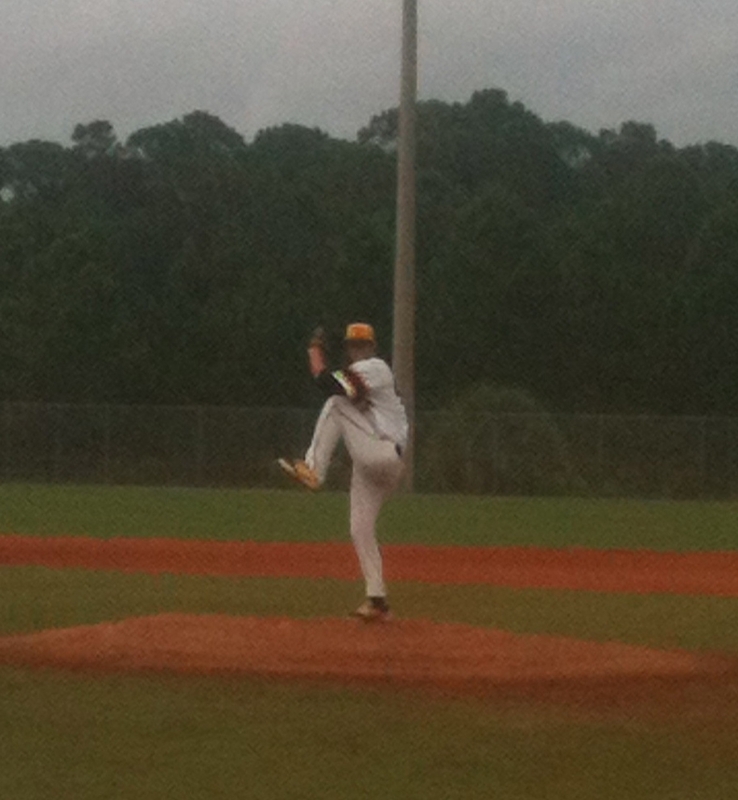 Threw a complete game allowing 1 run and had 6 strike outs. 7/2/14 – Smooth fielder with good feet and a nice arm. Short quick stroke with gap to gap power. Very good and aggressive base runner. 6/30/14 – Spark for the team in the leadoff spot. Has good speed and ran well. Good jumps in the outfield along with taking good routes to the ball. Sure hands in the outfield. Good swing, handles the bat well and able to bunt well. No roster information received from the coach. 7/2/14 – Short stroke line drive hitter the other way. Dave Magadan type hitter simple and easy. Good upside. 6/30/14 – Tall, strong, solid build. Aggressive hitter with a smooth contact swing and stays back. Knows the strike zone well. Makes solid contact to all fields, lets the ball travel and goes to the opposite field well. 7/2/14 – Long lean with a loose projectable arm. Smooth repeatable ¾ delivery with arm side run. Commands three pitches, fastball, curveball, and slider. Solid down hill plane on his fastball and 11/5 tight curveball. Strike thrower, aggressive in the zone, pitches to contact. 6/30/14 – Tall, lean build with room to grow and add strength. Showed good range with good reads in the outfield and great arm strength. Aggressive hitter keeps his weight and hands back. Solid contact line drive swing. Good speed and above average base runner taking extra bases. During the game he had an outfield assist from centerfield throwing out the runner at the plate. 7/2/14 – Versatile and athletic build. Tyler Pence type swing. Handles the bat well has good swing path and good barrel accuracy, and a good bunter. 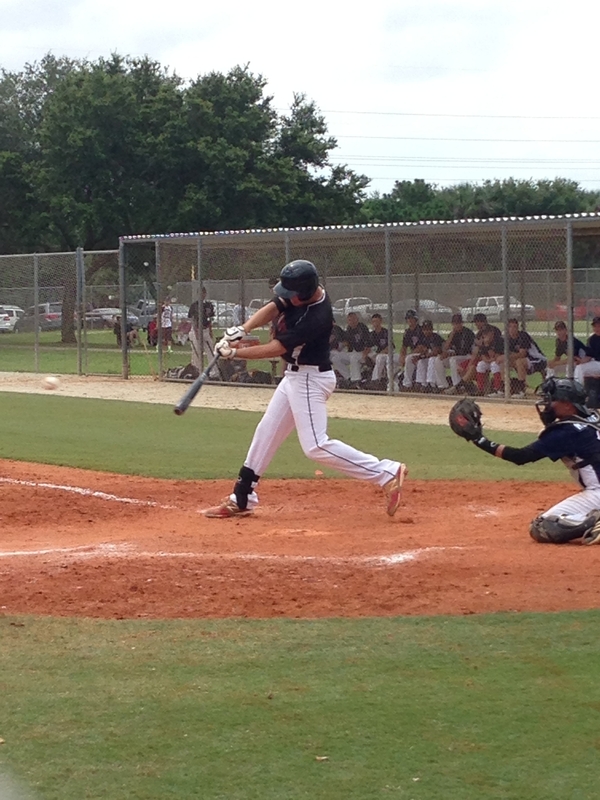 Multiple two hit games during pool play. 7/2/14 – Strong athletic frame. Plus range with a quick first step and an above average arm. Relaxed stance has good plate discipline, recognizes the off speed pitches well. Gap-to-gap power. This entry was posted in 2014 Under Armour Firecracker Classic, 2014 Under Armour Tournaments and tagged Alec Wisely, Anthony Gallici, Benito Varela, Boca Thunder, Brendan Brundage, Brian Rey, Chase Pilato, Cody Stone, Colton Ermian, David Moss, Eliott Cutillas, Elite Performance Baseball 18, Evan Schaffner, Florida Tornadoes 18, Ft. Caroline Indians, Handy Rodriguez, Jack Cambell, Jake Esp, James Tutor, Jorge Arenas, Jose Negron, Jose Rojas, Joseph Spano, Josh Nelson, Julian Cabrera, Ke'Bryan Hayes, Logan Evans, Lone Star Blue, Luis Besto, Matt Mosel, Max Guzman, Miami Barracudas Black 18, Michael Drag, Michael Rothenberg, Palm Beach Shockers White, PBC Gameday, Premier Baseball Academy Orlando 18 U, Rambert Paulino, Ramon Machado, Shane Mosiello, South Florida Breakers 17 Blue, South Florida Breakers 17 White, South Florida Clippers 18, St. Charles Saints, Team DeMarini Hayes, Top American Prospects 18, Tyler Anshaw, Tyler Gusow, Tyler Halas, Tyler Paulsen, Valley Forge 18U, West Boca Panthers, William Kelleher on July 2, 2014 by Team One Baseball.